iRobot Braava 380T Floor cleaner Robotic - BaglessThe iRobot Braava 380T is a mopping robot for multiple rooms and large spaces, providing hassle-free mopping and sweeping to tackle everyday dirt and grime. OPTIONAL ACCESSORIES, Mopping cloths. iAdapt helps the Braava 380T keep track of where it has been and where it needs to go. 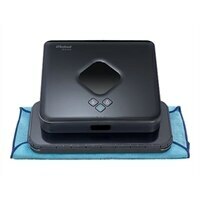 The Braava sweeps and mops extensive square feet in a single cleaning cycle. Triple-pass mopping action and damp cleaning cloths clean everyday dirt and grime. The Braava sweeps in straight lines back and forth to efficiently pick up dust, dirt, and hair. The iRobot Braava 380T is a mopping robot for multiple rooms and large spaces, providing hassle-free mopping and sweeping to tackle everyday dirt and grime. OPTIONAL ACCESSORIES, Mopping cloths.